In late August, a range rider found a calf with bite wounds and lacerations dead on public grazing lands in Ferry County, Washington. The Sherman wolf pack was at it again. The newly-formed pack had already taken three other livestock animals over the last 10 months, forcing the Washington Department of Fish and Wildlife to authorize lethal action against it. Under the state’s wolf plan, on Sept. 1, Fish and Wildlife officials killed one of the wolves, in hopes the remaining wolves would change their behavior. Earlier this summer, the agency killed two wolves from another pack, the Smackout, also due to livestock killings. Seven other wolves were removed from the Profanity Peak pack last fall. In a state where wolf recolonization is a relatively new phenomenon, the killings raised the hackles of wolf advocates — and questions about how the state will manage its new population. “We’re earlier in recovery, and we’re the outlet for the frustration for activists that didn’t get what they wanted from Rocky Mountain states,” says Paula Sweeden, carnivore policy lead at Conservation Northwest, a group that works with ranchers, agency officials and other conservationists to compromise on wolf policy. “I think it’s because we’re a last bastion.” Both the Profanity Peak and Smackout pack killings brought widespread commentary from organizations and individuals skeptical that killing wolves stops depredations. The Snake River wolf pack lopes through the snow in Hells Canyon National Recreation Area. 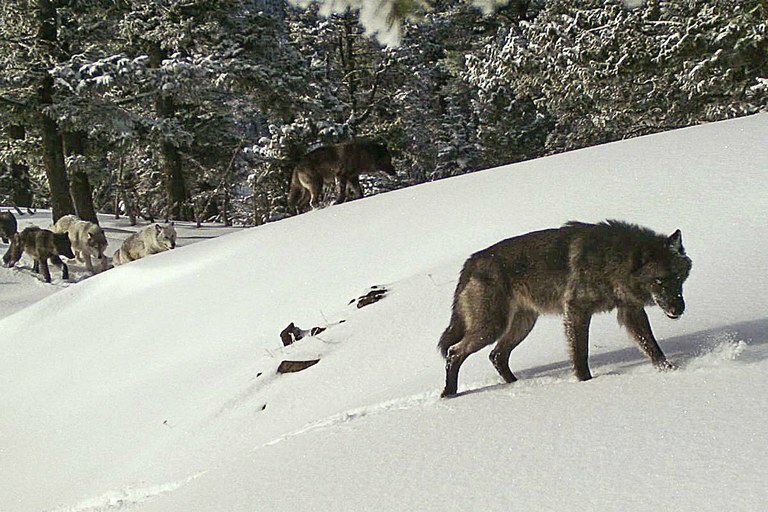 While this pack has not been targeted, two other Oregon wolf packs have been targeted after repeated killings of cattle this year. The Sherman pack in Washington represents only the fifth time since 2008, when the state's first wolf pack formed, that the agency has targeted a pack of wolves due to attacks on livestock. (By comparison, Wyoming killed 113 wolves in 2016, with much less outcry.) Washington’s wolf population has increased by 30 percent annually the past two years. That has heightened tensions between wolf advocates, ranchers and politicians. Joe Kretz, a Republican who represents District 7, has been outspoken about the impacts wolves have on ranchers. In January, he co-sponsored a bill to protect the identities of ranchers reporting livestock deaths. Critics say the bill threatens transparency in the wolf-killing process and some argue that Fish and Wildlife already obfuscates too often. Wolves are more likely to kill or attack livestock in late summer and early fall, as they prepare for winter and teach their pups to hunt. This year, four wolf packs in Oregon and Washington have been targeted after repeated killings of cattle. It is clear that as wolves become more established, perennial conflicts will arise. Still, Washington has no plans yet to revise its wolf management plan. Sweeden says some stakeholders think the plan does not need updating, since it has wolf population recovery goals “more robust than any other state, including Oregon.” To revisit the plan could weaken those goals. Instead, she thinks conflicts will level out as the packs disperse through the state, and as more ranchers and property owners take up deterrence methods. 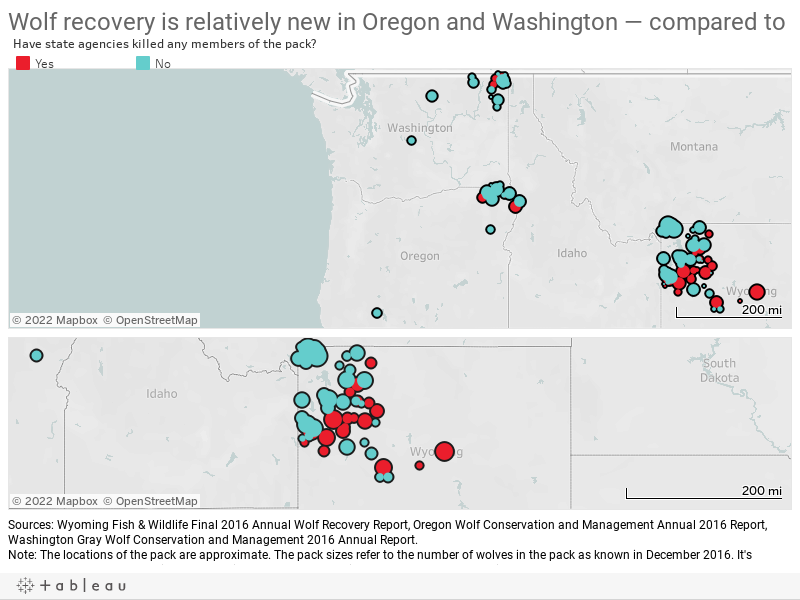 Washington’s wolves are likely to continue to thrive, no matter what, Martorello says. After all, they’re doing that without much help already. Instead, the real question has more to do with the humans, and how they’ll adapt to a carnivore reclaiming the landscape.